Best Price Pool Equipment offers a premium range of pool chemical controllers to keep your pool water chemistry in top form. Every pool owner needs to know a bit about chemistry and how to keep their spa and pool water clean and healthy for swimmers. This is best achieved through chemical controllers, designed and engineered for the sole purpose of keeping your pool water PH in perfect balance. Balanced water chemistry keeps your pool water bacteria-free, clean and clear. Our Chemigem® Automatic Water Management Controller, which has replaced the popular Chemigem® DM52, is a fantastic machine that does all the hard work for you. Guessing how much FC, CC, PH and TA is in the water, or needs to go into your water, requires a small degree in chemistry and a large dose of patience. Trying to determine your water’s ideal chemistry balance is enough to make anyone stop swimming altogether. However, our fully computerised D10 management system does all the work for you. All you do is feed it acid and chlorine, and sit back as the automatic pool chlorinator does the rest. Designed to analyse the water while your system is operational, the D10 and Chemflo Plus is an automatic PH controller. The Chemigem D10 is available with either a vacuum solenoid delivery system equipped with a suction line attached to the cylinder, which is a very reliable option. 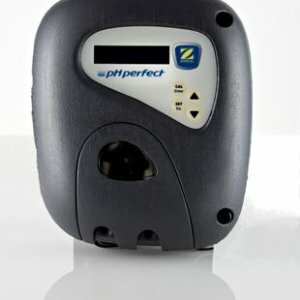 Alternatively, you can opt for a delivery system that goes via peristaltic pumps for an injection into the pressure line that delivers the acid and chlorine such as the Chemflo Plus. If you’re uncertain, please contact Nicole or come in store for further information. Automatic pool chemical controllers save you money, frustration and ensure a comfortable swimming experience thanks to its many benefits. Fully computerised water chemistry management systems. Constantly tests the pool water chemistry for pH and ORP (chorine’s oxidising potential). Fully digital backlit display panel shows set point and actual chemistry values for total control. Includes digital battery backup timer for setting daily running times. Manual override function for simple shock chlorination as desired. Affordable prices for premium pool controls, equipment and chemicals, designed to keep your pool and spa as clean and healthy as possible.